This volume presents in-depth investigations of the processes of meaning-making during reading at both local (discourse) and global (general knowledge) levels. It considerably extends our knowledge of how mental representations are constructed and updated during reading. 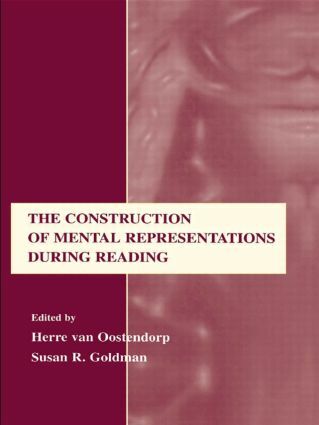 The book also provides insight into the process of representation construction by using online measures and relating this process with final memory representations; provides detailed models of these processes; pays attention to the coordination of multiple representations constructed; focuses on the monitoring and updating of mental representations; and applies all this knowledge to richer and more complicated texts than are often used in laboratories. "This is an excellent text….the chapters should prove useful not only for scholars whose primary work is in the study of discourse processes, but also for those whose primary work is in related fields of inquiry….I recommend this text without reservation for all scholars involved in literacy research, and I have no doubt that it will be widely used and widely cited for years to come." "In general, this book stands as a worthwhile addition to a discourse researcher's library. It offers a coherent, up-to-date view of some of the most central issues in the discourse representation literature….the chapters contained here have been assembled into a framework that is both coherent and highly informative. Contents: Introduction: Some Initial Considerations. Part I: Models of Processing and Representation. S. Garrod, A. Sanford, Incrementality in Discourse Understanding. M. Langston, T. Trabasso, Modeling Causal Integration and Availability of Information During Comprehension of Narrative Texts. P. van den Broek, M. Young, Y. Tzeng, T. Linderholm, The Landscape Model of Reading: Inferences and the Online Construction of Memory Representation. C.A. Perfetti, J-F. Rouet, M.A. Britt, Toward a Theory of Documents Representation. T.A. van Dijk, Context Models in Discourse Processing. Part II: Processes and Strategies of Representation Construction. S. Caillies, G. Denhière, S. Jhean-Larose, The Intermediate Effect: Interaction Between Prior Knowledge and Text Structure. N. Coté, S.R. Goldman, Building Representations of Informational Text: Evidence From Children's Think-Aloud Protocols. V. Gyselinck, H. Tardieu, The Role of Illustrations in Text Comprehension: What, When, For Whom, and Why? J.P. Magliano, R.A. Zwaan, A. Graesser, The Role of Situational Continuity in Narrative Understanding. E.C. Ferstl, W. Kintsch, Learning From Text: Structural Knowledge Assessment in the Study of Discourse Comprehension. Part III: Monitoring and Updating Representations. M-F. Ehrlich, Metacognitive Monitoring of Text Cohesion in Children. H.M. Johnson, C.M. Seifert, Modifying Mental Representations: Comprehending Corrections. H. van Oostendorp, C. Bonebakker, Difficulties in Updating Mental Representations During Reading News Reports. I. Tapiero, J. Otero, Distinguishing Between Textbase and Situation Model in the Processing of Inconsistent Information: Elaboration Versus Tagging. S.R. Goldman, H. van Oostendorp, Conclusions, Conundrums, and Challenges for the Future.